Genaro “Poblanito” Garcia who lost by a twelve round TKO to undefeated Filipino Genesis “Azukal” Servania on June 2, 2012 in a battle for the vacant WBC International super bantamweight Silver title has died of four gunshot wounds in the head. The body of “Poblanito” was found in a farmland property called Tecala to Acotzala riverside and behind the church in San Lorenzo. 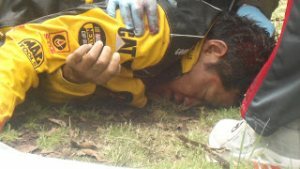 The report which was in Spanish said that according to authorities Garcia had boarded his car when he was chased by several armed men up to the community of Juan Tuxco where they pulled Garcia out of his car, subdued him and took hims aboard a van which was a gray Honda Oddesey to the farm where he was shot to death. Authorities have the number of the van’s license plate..
ALA Promotions manager Michael Aldeguer said he was “shocked” when he heard the tragic news while trainer Edito “Ala” Villamor said Garcia was a fine boxer and an excellent human being who gave them no problems and acknowledged his loss to Servania in a close fight that was decided by the two knockdowns scored by Servania in the final round. After the fight Garcia acknowledged that Servania punched harder than WBC super champion Toshiaki Nishioka to whim he lost in a title fight in Japan. International referee Bruce McTavish told us Garcia was “a lovely person, that is why I embraced him when I stopped the fight,” at the Resorts World Hotel in Manila which was telecast in the ABS-CBN “Pinoy Pride” series. In a strange coincidence, McTavish was also the referee when Garcia fought Nishioka for the world title and lost by another 12th round TKO on June 3, 2009. McTavish was the person who exposed the “fake” Genaro Garcia whose nickname was “Panterito” who assumed the identity of the real Garcia, a world title challenger, when he fought Rey “Boom Boom” Bautista and was mercifully knocked out in the second round. “Poblanito” Garcia’s record was 38-9 with 22 knockouts and boasted of victories over world champions Adonis Rivas, Mauricio Martinez, Rafael Marquez and Victor Rabanales. He also hjad wins over Mike Roman. Oscar Arciniega and Cuauhtemoc Gomez among others.